Gotham City Imposters' blend of Batman and Call of Duty is both strange and strangely appealing. Gotham City Imposters reminds me of the early 00s, when Half-Life and Unreal Tournament multiplayer mods occupied the majority of my time. From this perspective, Imposters isn't a blatant clone of a popular series but an interesting twist on it. That series being Call of Duty, and the twist being Batman's gadgets and support items. In nearly every facet, Imposters recalls CoD. From shooting to capturing a node on the map, the game feels like a carbon-copy. The only substantial addition to the formula are the gadgets and support items each player can use. I used the grappling hook in the demo, which drastically changed the flow of the game. It gives the player the ability to latch onto any surface and quickly move toward it. Half of the fun is seeing what you can get away with, with the gadgets. I spent most of the demo clinging to the highest walls on the map and dropping on enemies with a knife kill. This might sound like a feature, reminiscent of Assassin's Creed but, in truth, it's just me seeing what I can get away with, with the tools provided. Along with the grappling hooks, players also have access to glider wings, rollerskates, and more, yet-to-be-announced gadgets. There are also support items which take the place of projectiles and grenades. 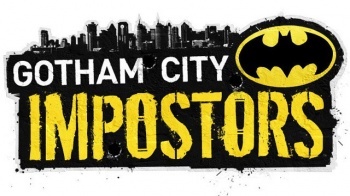 Tonally, Imposters has more in common with the Batman animated series than Arkham Asylum. Everything from the run down amusement park map featured in the multiplayer demo to the character design has a colorful, light-hearted feel to it. Well, as light-hearted as criminal gangs donning clown masks can be. I call Imposters a CoD mod in the most endearing way possible. The game re-skins and renames a game familiar to many players, while adding enough new features to change things up. The game isn't exactly daring or the best fit for the liscenese, but it's a lot of fun for a downloadable title (available via PSN, XBLA and PC). Call of Duty with ominous clowns and a grappling hook? Sure, I'll download that.